« “Hey, lady! Want to meet my pet?” A visit to Boca da Valeria, Brazil! If you are docking in Scarborough, Tobago as a cruise ship passenger, you’ll find being a tourist here is very easy. Get off the ship, and head into the cruise ship terminal. That’s where you’ll find the tourist bureau. Taxi drivers, many of them, are all lined up and waiting to chauffeur you around the island. The better news is that a cabbie will cost only $25/hour before tip. Things to do include sun-bathing at Pigeon Point beach; history buffs may enjoy a visit to Fort King George; bird lovers will definitely want to head up into the rainforest reserve (it was established in the late 1700s); and nature lovers won’t want to miss the 3-tiered Argyle waterfall. Just wandering around the town of Scarborough is a great adventure. 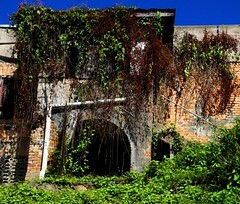 Up the hill from the docks, I found this picturesque old building bedecked in trailing vines. The people are quite friendly and easily approached if you need information. There is a huge marketplace and plenty of places to eat. However, I would still encourage you to grab a taxi and spend 2-4 hours sightseeing. If your time is limited, head up into the rain forest. The traffic is very light, and you can pull over and immerse yourself in the sounds of the forest. You will see many colorful birds and gorgeous plants. A camera is a must. This entry was posted on Saturday, February 21st, 2009 at 7:45 pm and is filed under Adventure Travel, Caribbean, Cruise Ship Travel, Family Vacations, Ports of call, Travel Destinations, Variety. You can follow any responses to this entry through the RSS 2.0 feed. Both comments and pings are currently closed.